James Herriot has now become firmly established and accepted as one of Darrowby's veterinarians. He's also married, and lives with his wife Helen on the top floor of Skeldale House. His former boss, now partner, Siegfried, lives downstairs with Siegfried's brother Tristan. 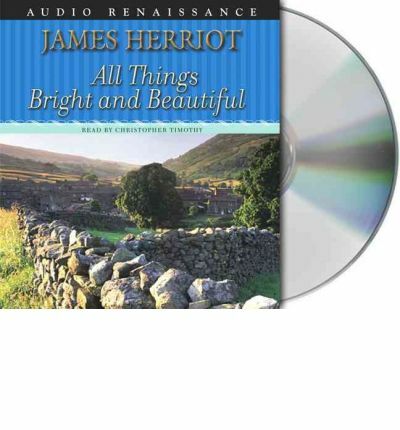 James continues the rich and rewarding day-to-day life of a small-town veterinarian, and we journey with him across the dales, meeting a whole new cast of unforgettable characters -- humans, dogs, horses, lambs, parakeets -- all of them drawn with the same infinite fascination, affection and insight that made James Herriot one of the most beloved authors of our time. All all the stories are warmly, evocatively told by the world-renowned "voice" of Dr. Herriot -- Christopher Timothy. About the Author: James Herriot lived in Yorkshire, England with his wife and family, where his son has now taken over his veterinary practice. He is the author of the classic international bestsellers All Things Bright and Beautiful, All Things Wise and Wonderful, and The Lord God Made Them All. He is also the author of numerous collections of short stories and a series of illustrated books for children. Dr. Herriot died in February 1995.Christopher Timothy starred as James Herriot in “All Creatures Great and Small,” the internationally renowned BBC television series based on Herriots work. A veteran of stage, screen, and TV, Mr. Timothy is a winner of the prestigious Sir John Gielgud Scholarship and the Sir Laurence Olivier Award. He also co-produced and starred in a critically acclaimed film version of James Herriots Yorkshire.